An illustration that shows how antigens induce the immune system response by interacting with an antibody that matches the antigen's molecular structure. In immunology, antigens (Ag) are structures (aka substances) specifically bound by antibodies (Ab) or a cell surface version of Ab ~ B cell antigen receptor (BCR). The terms antigen originally described a structural molecule that binds specifically to an antibody only in the form of native antigen. It was expanded later to refer to any molecule or a linear molecular fragment after processing the native antigen that can be recognized by T-cell receptor (TCR). BCR and TCR are both highly variable antigen receptors diversified by somatic V(D)J recombination. Both T cells and B cells are cellular components of adaptive immunity. The Ag abbreviation stands for an antibody generator. Antigens are "targeted" by antibodies. Each antibody is specifically produced by the immune system to match an antigen after cells in the immune system come into contact with it; this allows a precise identification or matching of the antigen and the initiation of a tailored response. The antibody is said to "match" the antigen in the sense that it can bind to it due to an adaptation in a region of the antibody; because of this, many different antibodies are produced, each able to bind a different antigen while sharing the same basic structure. 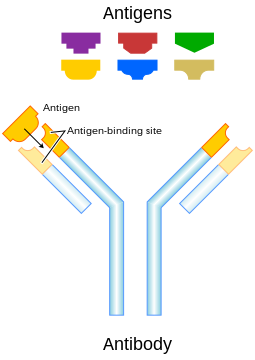 In most cases, an adapted antibody can only react to and bind one specific antigen; in some instances, however, antibodies may cross-react and bind more than one antigen. Also, an antigen is a molecule that binds to Ag-specific receptors, but cannot necessarily induce an immune response in the body by itself. Antigens are usually proteins, peptides (amino acid chains) and polysaccharides (chains of monosaccharides/simple sugars) but lipids and nucleic acids become antigens only when combined with proteins and polysaccharides. In general, saccharides and lipids (as opposed to peptides) qualify as antigens but not as immunogens since they cannot elicit an immune response on their own. Furthermore, for a peptide to induce an immune response (activation of T-cells by antigen-presenting cells) it must be a large enough size, since peptides too small will also not elicit an immune response. The antigen may originate from within the body ("self-antigen") or from the external environment ("non-self"). The immune system is supposed to identify and attack "non-self" invaders from the outside world or modified/harmful substances present in the body and usually does not react to self-antigens under normal homeostatic conditions due to negative selection of T cells in the thymus. Vaccines are examples of antigens in an immunogenic form, which are intentionally administered to a recipient to induce the memory function of adaptive immune system toward the antigens of the pathogen invading that recipient. Paul Ehrlich coined the term antibody (in German Antikörper) in his side-chain theory at the end of the 19th century. In 1899, Ladislas Deutsch (Laszlo Detre) (1874–1939) named the hypothetical substances halfway between bacterial constituents and antibodies "substances immunogenes ou antigenes" (antigenic or immunogenic substances). He originally believed those substances to be precursors of antibodies, just as zymogen is a precursor of an enzyme. But, by 1903, he understood that an antigen induces the production of immune bodies (antibodies) and wrote that the word antigen is a contraction of antisomatogen (Immunkörperbildner). The Oxford English Dictionary indicates that the logical construction should be "anti(body)-gen". Superantigen – A class of antigens that cause non-specific activation of T-cells, resulting in polyclonal T-cell activation and massive cytokine release. Tolerogen – A substance that invokes a specific immune non-responsiveness due to its molecular form. If its molecular form is changed, a tolerogen can become an immunogen. Immunoglobulin-binding protein – Proteins such as protein A, protein G, and protein L that are capable of binding to antibodies at positions outside of the antigen-binding site. While antigens are the "target" of antibodies, immunoglobulin-binding proteins "attack" antibodies. T-independent antigen – Antigens that stimulate B cells directly. Antigen presenting cells present antigens in the form of peptides on histocompatibility molecules. The T cell selectively recognize the antigens; depending on the antigen and the type of the histocompatibility molecule, different types of T cells will be activated. For T Cell Receptor (TCR) recognition, the peptide must be processed into small fragments inside the cell and presented by a major histocompatibility complex (MHC). The antigen cannot elicit the immune response without the help of an immunologic adjuvant. Similarly, the adjuvant component of vaccines plays an essential role in the activation of the innate immune system. An immunogen is an antigen substance (or adduct) that is able to trigger a humoral (innate) or cell-mediated immune response. It first initiates an innate immune response, which then causes the activation of the adaptive immune response. An antigen binds the highly variable immunoreceptor products (B cell receptor or T cell receptor) once these have been generated. Immunogens are those antigens, termed immunogenic, capable of inducing an immune response. At the molecular level, an antigen can be characterized by its ability to bind to an antibody's variable Fab region. Different antibodies have the potential to discriminate among specific epitopes present on the antigen surface. A hapten is a small molecule that changes the structure of an antigenic epitope. In order to induce an immune response, it needs to be attached to a large carrier molecule such as a protein (a complex of peptides). Antigens are usually carried by proteins and polysaccharides, and less frequently, lipids. This includes parts (coats, capsules, cell walls, flagella, fimbriae, and toxins) of bacteria, viruses, and other microorganisms. Lipids and nucleic acids are antigenic only when combined with proteins and polysaccharides. Non-microbial non-self antigens can include pollen, egg white and proteins from transplanted tissues and organs or on the surface of transfused blood cells. Exogenous antigens are antigens that have entered the body from the outside, for example, by inhalation, ingestion or injection. The immune system's response to exogenous antigens is often subclinical. By endocytosis or phagocytosis, exogenous antigens are taken into the antigen-presenting cells (APCs) and processed into fragments. APCs then present the fragments to T helper cells (CD4+) by the use of class II histocompatibility molecules on their surface. Some T cells are specific for the peptide:MHC complex. They become activated and start to secrete cytokines, substances that activate cytotoxic T lymphocytes (CTL), antibody-secreting B cells, macrophages and other particles. Some antigens start out as exogenous, and later become endogenous (for example, intracellular viruses). Intracellular antigens can be returned to circulation upon the destruction of the infected cell. Endogenous antigens are generated within normal cells as a result of normal cell metabolism, or because of viral or intracellular bacterial infection. The fragments are then presented on the cell surface in the complex with MHC class I molecules. If activated cytotoxic CD8+ T cells recognize them, the T cells secrete various toxins that cause the lysis or apoptosis of the infected cell. In order to keep the cytotoxic cells from killing cells just for presenting self-proteins, the cytotoxic cells (self-reactive T cells) are deleted as a result of tolerance (negative selection). Endogenous antigens include xenogenic (heterologous), autologous and idiotypic or allogenic (homologous) antigens. Sometimes antigens are part of the host itself in an autoimmune disease. An autoantigen is usually a normal protein or protein complex (and sometimes DNA or RNA) that is recognized by the immune system of patients suffering from a specific autoimmune disease. Under normal conditions, these antigens should not be the target of the immune system, but in autoimmune diseases, their associated T cells are not deleted and instead attack. Tumor antigens are those antigens that are presented by MHC class I or MHC class II molecules on the surface of tumor cells. Antigens found only on such cells are called tumor-specific antigens (TSAs) and generally result from a tumor-specific mutation. More common are antigens that are presented by tumor cells and normal cells, called tumor-associated antigens (TAAs). Cytotoxic T lymphocytes that recognize these antigens may be able to destroy tumor cells. A large fraction of human tumor mutations are effectively patient-specific. Therefore, neoantigens may also be based on individual tumor genomes. Deep-sequencing technologies can identify mutations within the protein-coding part of the genome (the exome) and predict potential neoantigens. In mice models, for all novel protein sequences, potential MHC-binding peptides were predicted. The resulting set of potential neoantigens was used to assess T cell reactivity. Exome–based analyses were exploited in a clinical setting, to assess reactivity in patients treated by either tumor-infiltrating lymphocyte (TIL) cell therapy or checkpoint blockade. Neoantigen identification was successful for multiple experimental model systems and human malignancies. The false-negative rate of cancer exome sequencing is low—i.e. : the majority of neoantigens occur within exonic sequence with sufficient coverage. However, the vast majority of mutations within expressed genes do not produce neoantigens that are recognized by autologous T cells. As of 2015 mass spectrometry resolution is insufficient to exclude many false positives from the pool of peptides that may be presented by MHC molecules. Instead, algorithms are used to identify the most likely candidates. These algorithms consider factors such as the likelihood of proteasomal processing, transport into the endoplasmic reticulum, affinity for the relevant MHC class I alleles and gene expression or protein translation levels. ^ K. Abbas, Abul; Lichtman, Andrew; Pillai, Shiv (2018). Cellular and molecular immunology (Ninth ed.). Philadelphia: ELSEVIER. p. 97. ISBN 978-0-323-52324-0. ^ Male, David K. (2006-01-01). Immunology. Elsevier Health Sciences. p. 10. ISBN 9780323033992. ^ a b Gavin, AL; Hoebe, K; Duong, B; Ota, T; Martin, C; Beutler, B; Nemazee, D (22 December 2006). "Adjuvant-enhanced antibody responses in the absence of toll-like receptor signaling". Science. 314 (5807): 1936–8. doi:10.1126/science.1135299. PMC 1868398. PMID 17185603. ^ "Antigens - Boundless Anatomy and Physiology". courses.lumenlearning.com. ^ Gallucci, S; Lolkema, M; Matzinger, P (November 1999). "Natural adjuvants: endogenous activators of dendritic cells". Nature Medicine. 5 (11): 1249–55. doi:10.1038/15200. PMID 10545990. ^ Strebhardt, Klaus; Ullrich, Axel (Jun 2008). "Paul Ehrlich's magic bullet concept: 100 years of progress". Nature Reviews Cancer. 8 (6): 473–480. doi:10.1038/nrc2394. ISSN 1474-1768. PMID 18469827. ^ Doolan DL, Southwood S, Freilich DA, Sidney J, Graber NL, Shatney L, Bebris L, Florens L, Dobano C, Witney AA, Appella E, Hoffman SL, Yates JR, Carucci DJ, Sette A (August 2003). "Identification of Plasmodium falciparum antigens by antigenic analysis of genomic and proteomic data". Proceedings of the National Academy of Sciences of the United States of America. 100 (17): 9952–7. doi:10.1073/pnas.1633254100. PMC 187898. PMID 12886016. ^ Janeway CA, Jr (1 November 2013). "Pillars article: approaching the asymptote? Evolution and revolution in immunology. Cold spring harb symp quant biol. 1989. 54: 1–13". Journal of Immunology. 191 (9): 4475–87. PMID 24141854. ^ Gayed, PM (June 2011). "Toward a modern synthesis of immunity: Charles A. Janeway Jr. and the immunologist's dirty little secret". The Yale Journal of Biology and Medicine. 84 (2): 131–8. ISSN 1551-4056. PMC 3117407. PMID 21698045. ^ Kuby Immunology (6th ed.). Macmillan. 2006. p. 77. ISBN 978-1-4292-0211-4. ^ "Antigen". US National Library of Medicine. Retrieved 2015-07-30. ^ a b c d e f g h i Schumacher, Ton N.; Schreiber, Robert D. (April 3, 2015). "Neoantigens in cancer immunotherapy". Science. 348 (6230): 69–74. doi:10.1126/science.aaa4971. PMID 25838375. ^ "Antigen specificity – Medical Terms". Steadyhealth.com. 2010-12-17. Archived from the original on 2011-09-30. Retrieved 2012-07-08.